Tarte Smooth Operator: The Tarte tinted moisturizer is oil-free, which is great during the hot summer months. It contains SPF 20--and I think we all know by now just how important it is to truly protect our skin, especially our face, from the sun. 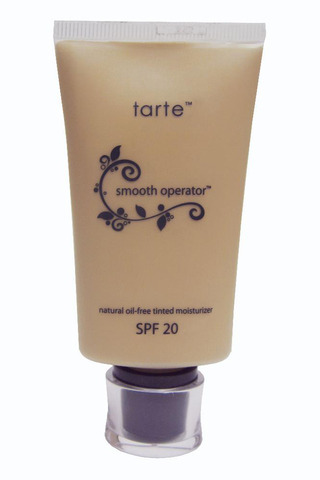 You can get this light-coverage, tinted moisturizer at Sephora for $36, and it comes in a variety of shades! 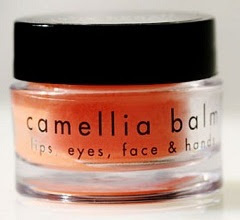 Julie Hewett Camillia lip balm: This lightweight lip treatment smells like a creamsicle, which only adds to its appeal in the summer. For only $14 you can get this wonderful lip balm that comes in natural, ruby or rose with UVA protection. The balm is made of Oleic oils and anti-oxidants, and is actually good enough to use on your lips or your entire face. Sally Hansen insta dri nail polishes: I happen to have the Sally Hansen insta-dri in pink and it's beautiful! But you should get it in every color as it's really inexpensive and actually dries instantly. The brush is really different from other brushes, which some people may or may not like, but the quick dry makes it ideal for the summer. You can also try out the Sally Hansen Salon Effects if you can master the strips! I have a pair of these that I have yet to use, but I promise I will give them a go this summer for sure! Oscar Blandi Pronto Dry Shampoo: I recently bought this dry shampoo, which I mentioned in a makeup and muses post back in April. I've used it a couple of times so far and I actually like it. Some people are wary of dry shampoos, but they are actually great if you are going a day or two without washing your hair. FYI - people with really curly hair usually don't need to wash their tresses as often). 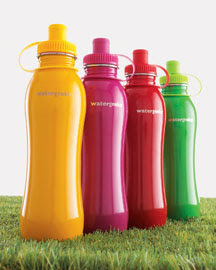 Neiman Marcus Filtered Water Bottles: For $24 you get 24 ounces of pure, filtered water that is contained in an eco-friendly bottle from Neiman Marcus. The bottle filters for taste and potential contaminants and is clearly reusable. Now I know this isn't a makeup product or a skincare item per se, but when it comes to the summer, it's always great to have a water bottle with you so you can keep hydrated. The fact that these are both cute and good for the environment are just added bonuses. What are some of your makeup essentials for summer? Love your blog, what do you think about following each others? :) You look so musing! Kisses from Italy! Great choices! I need to try those insta-dri polishes! What a cool water bottle as well! I really want to try out the Sally Hansen stuff! My summer essentials are Avon SPF 30 tinted moisturizer and Batiste dry shampoo. i want those nails! super cute. im a big fan of doing your nails up for the summer.. I love Tarte products so much!! They are the best AND all natural haha. I am so proud you like my blog and are following me, of course I am following you too on google friend connect, your blog is awesome ! ctually I am gonna follow you also with Bloglovin, do the same if you want to ! I really want to try that NM filtered water now. The bottles are adorable! The only water that I drink is filtered or SmartWater. I hatehatehate tap water. Ew. That camilla lip balm really caught my eyes. As it is Autumn here (a very cold autumn at that) I am doing every thing to protect my lips! def love spf moisturizer, so important for summer! 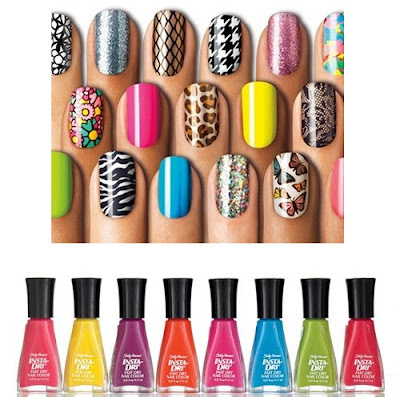 and also the sally hansen nail polishes are so lovely, i love the fun bright colors! Those instant nail polishes are brilliant! Want, want, want everything. I love the dry shampoo and the neiman marcus bottles especially!!! my summer essentials would be..
1)coconut oil first of all!! i never tried dry shampoo... but i think I'll buy some this summer. Ooh those nail polish colours are GORGEOUS! I've missed you and your lovely blog darling, how have you been? Hope you're staying safe and chic dearest! OMG I was just at CVS the other day and was totally looking at the Sally Hansen nails!! I may go back today to get them. My Summer essentials are definitely Sunblock and Sally Hansen Airbrush legs!! Neon nails please! Never thought I'd be into something like that, french nails were a must at Catholic school, but now I'm all about bright neons! i have a few sally hansen insta dry nailpolishes as well as the sticker nails. i've been meaning to try that dry shampoo since i heard about it. next purchase! That quick dry polish sound good to me! I'm the worst about smudging my manis. salle hansen nail polish is one of my summer essential too! and thanks for your lovely comment, yeah after visitng cambodia and seeing some people's living conditions we are really lucky to be living where we are today! Those nail polish colors and prints look fun to try! I love Sally Hansen nail effects ! I wish you could buy them here! i want to try those nail strips so bad! !